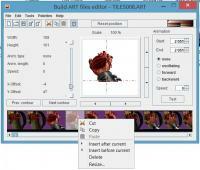 My ART files editor (BAFed) "Build ART Files Editor ver1.16"
Of course, It isn't convenient to use several programs for ART editing, therefore I made own program, which combines these two programs, with other palettes support and comfortable GUI like Dukeres. My program also have other good functions as 32bit png-image support. Uploaded 32bit image will automaticaly converted to choosed palette. 6. For make animation you can choose last tile of animation with Ctrl + LMB, animation will be from choosed tile to last tile. 7. I made movable preview picture of choosed tile....you can see at all parts of the picture at 700% scale. I really appreciate that you've gone to the effort of creating this. As you've noted, there never really were very many decent art utilities. How about adding support for rudimentary reading and writing of .def files and integration with functionality like tilefromtexture? I think I can do it, but poorly represent the processing of the def file. Will it be working with 32bit images? I wanted to download but your Joomla installation seems to be f***ed up for some reason. when I import a .png with transparancy and a size of let´s say 512x512px and I resize it down to 128x128 the transparancy is turned to black. Also, can you put some keyboard shortcodes to the program. That would make even more easier. Yep I forgot about this bug, I'll try to fix it. Which functions do you want to have with keyboard shortcodes? What are you thinking about ART editor on Android OS? Somebody want to use it on Android? That's pretty awesome ... I see it works for SW so Imma gonna grab this. Thankyou. As much as possible . At least the Edit and Tools options would be awesome. Would save a lot of time compared to going there with the mouse every time. Why not? Working on Art files while not at home sounds good. Also a save your selfies to ART option. I´m not a Java developer, but would it be possible to make a web-based version of it, which can be integrated on websites? This editor is super handy and easy to use, and also very fast! I'm glad you did this M210, very good job! Looks like you inherited Dukeres misplaced texture x-offset. Positive values move the texture top-left, and negatives values bottom-right. Could you make it so that you can type the offsets? I would also like to see it on fullscreen with the gallery extended. Yes, I inherited Dukeres, but your discription about x-offset seems wrong. Look at the screenshots - negative values of x-offsest and y-offset and tile place is bottom-left. Could you make it so that you can type the offsets? I would also like to see it on fullscreen with the gallery extended. Not at this time, but maybe at future will try. Java as a web plugin is on its way out. Hey M210, is there any chance of adding a feature or changing the program so the tile numbers don't change if you save an art file that doesn't have a 000 art tile number? Basically imagine I have an artfile called BLAH.art and it starts at tile number 1024 - if I save it in Dukeres or BAFed than it's tile numbers will revert back to 0 so I'd have to rename it to TILES004.art, save it, and then rename it back again. so I'd have to rename it to TILES004.art, save it, and then rename it back again. Can I use this program to easily add the Duke3d textures to Sw? If so, can you give me a quick how-to? I really want a mass amount of "new" textures added to Sw to map with. Thanks in advance. So, I've loaded duke tile000.art as I see you can't load ALL the .art files at once? When I load the first art file from duke and then apply the Sw colour palette, all the duke tiles look garbled, which I guess was to be expected but I was hoping some magic would occur and the duke tiles be converted to the Sw palette. How do you change the duke tiles to Sw palette? Also, how would I change the tile numbers so they carry on from where the default Sw tile numbers leave off? If I do manage to get the Duke tiles to an Sw pal, would I then have to add all the Duke tiles one by one so they continue on with the correct tile numbers? I can add individual external art files to Sw using editART and I was hoping I could accomplish my goal easily with this program. Some1 help, or correct me if I'm wrong. * A feature this program needs is: If you copy an art tile from 1 game set(duke) and paste it to another tile set(Sw) It needs to convert the palette for that tile automatically. Also - Need to be able to select more than 1 tile at a time to copy/paste. This program would be handier than a pocket in a shirt if it had those functions. Then I could add art from duke/rr/blood to Sw or vise versa. This will rip the art tiles out and save them as .png files. Next you can open a new .art file with the new palette selected or just an existing .art file(Sw) and then Tools> Batch Import and select the .png files/tile numbers to import. You have to go back and re-animate the animated tiles which takes time but it's about as good as it's going to get. *edit - The proper method is slightly different.. see below posts. I've ripped every .art file from duke to it's own folder to keep them separate(in .png format,) indeed I see the information file also as it relates to each .art file ripped. So far so good. This is going to take a few tries. I wonder if Sw has an art tile limit.. The default Sw tiles leave off as Tiles021.art. Next, I've create a new tileset it asks what tile to start at and I tell it 0. Then it asks how many tiles to put in the set and I've been telling it the appropriate number of tiles each duke .art file has. Which will turn into the equivalent Sw .art file. Then I import the appropriate ripped duke art folder and when I select the format, I've selected the description .ini file and it loads nicely. I then save that as Tiles022.art and when I open it in my SW BUILD program it adds the new tiles at the end of the default tiles and keeps all the animations. This seems to be working stupidly well. I'm up to Tiles029.art now and still going. *Edit - Whelp, just added 99% of the Duke atomic art to Sw with the animations intact, complete success! Now to try adding some Blood art This is a game-changer for me. I have so much art to work with now it's awesome. ...Just dove into some Redneck Rampage art, this is too much fun. It's a shame I've run out of room for new tiles. I do have some blank spots I could fill, going to try and make the ultimate Shadow Warrior texture pack. 1. Added fast conversion palette of choosed tile. 2. I added custom palette menu after loaded external palette, therefore you can swithing between duke3d, blood or sw palette and your own loaded palette faster.